Fictiv, a San Francisco-based contract manufacturing platform, has announced it has raised a $33 million Series C funding round to accelerate the transformation of contract manufacturing and turn it into a global digital ecosystem that enables flexible hardware product development and production. This round of funding was led by G2VP. And new investor Mitsui & Co. is joining returning investors Accel, Bill Gates, Intel Capital, Sinovation, and Tandon Group. With this funding round, Fictiv will be accelerating its work to digitize and automate the manufacturing workflow. Including this round, Fictiv has raised a total of $58 million. 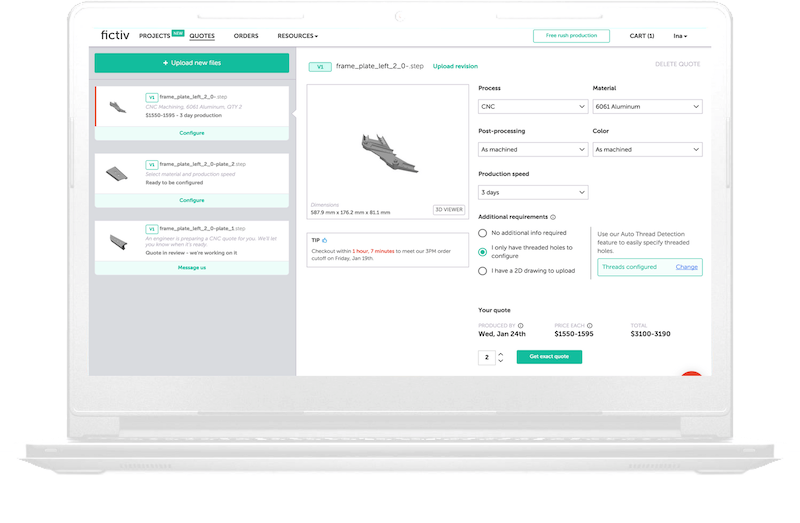 Fictiv’s cloud-based contract manufacturing platform provides transparency, reduces the resources required for supply chain management, and lowers the cost to access manufacturers around the world. Some of Fictiv’s core initiatives include investment in its cloud infrastructure and software tools to streamline workflow and expand its global investment in its cloud infrastructure and software tools to streamline workflow, expansion of its global manufacturing network to increase access to manufacturing capabilities, materials, capacity, and talent. Some of the features and benefits of Fictiv’s platform include 3D printing, CNC, urethane casting, injection molding, finishing and post-processing services, Automatic Design for Manufacturability (DFM) feedback, online order tracking for visibility on production and shipment status, high-quality global manufacturing experts, online order tracking, and Quality Services.